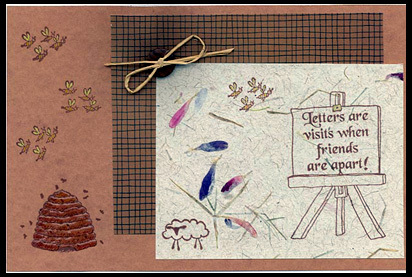 “Four Bees”, “Lamb #2, Lg.”, “Easel” and “Letters are Visits…” are stamped in brown Memories ink on gray hand made paper and the four bees are colored with pencils. “Bees and Hive” is stamped in brown Memories ink on tan card stock and colored with pencils. Embellishments of woven background mesh, a button and a raffia bow are added and card stock pieces are layered as seen here. Card by Thalia Sledge.